Rescue operations to evacuate stranded pilgrims on Tuesday came to an end in disaster-hit Uttarakhand with a group of 150 being safely taken out from Badrinath while bad weather hampered the cremation of bodies in Kedarnath area for the fourth day. Officials said rescue of pilgrims was over in the state and evacuation of locals will be gone gradually with the restoration of the road network. The administration was now focusing on supplying relief to worst-hit areas as foodgrain shortage was being reported in 170 villages. 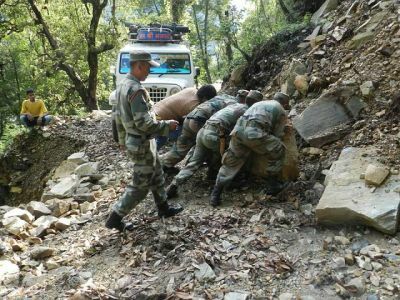 With the road network washed away in many areas, a patrol party has been sent beyond Gaurikind along with PWD gangmen to clear the debris in order to reach the cut off villages. Chamoli District Magistrate S A Murugesan said, "All the pilgrims stranded in Badrinath dham have been evacuated. Now some locals and Nepali labourers remain there who will be evacuated by this evening if the weather permits." However, the cremation of bodies lying in Kedarnath could not be done for the fourth day today due to bad weather. Director General of Police Satyavrat Bansal said a 200-member team of medical experts and police personnel had left for Kedarnath to help in the task of cremation of bodies but bad weather in the area has stalled the work. Around 65 bodies are lying in the Kedarnath area. On the 17th day of the calamity, the number of bodies cremated there so far is still pegged at 36. Murugesan told PTI that supply of relief to affected villages continues to pose a challenge to the administration with a vast network of roads and bridges still damaged in the area. The bridge over Alaknanda at Lambagar is badly damaged which will take at least 2-3 months to be repaired, he said, adding that the BRO is working on it. Officials said taking relief material to remote villages due to poor connectivity is a major problem. Though choppers are being used for the purpose the exercise is confined to just a few areas, they said. With Gaurikund-Kedar Highway still closed, there is foodgrain shortage in at least 170 villages in Kedarghati area in Rudraprayag district, officials said. But relief material has been dispatched to Kalimath, Chandrapuri and Sauri areas in the district. Aishwarya, Vidya, Parineeti: Here's what their fathers do!